Merch is creative, stylish, light Weight WooCommerce WordPress theme designed for faster load time even in very slow internet connection. So, you never lost your valuable customers who willing to purchase something through your online shopping site. 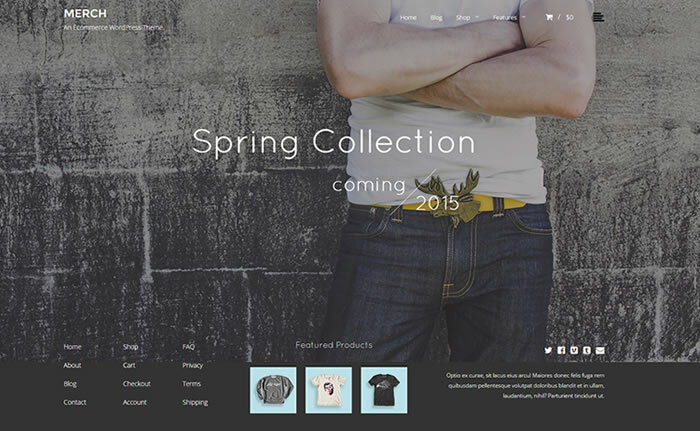 Merch WooCommerce theme has powerful unbranded admin panel, developers who love it. Its ultra responsive, retina ready wordpress theme included with handy blog templates helps you to build blog section to your shopping site. Merch light Weight WooCommerce WordPress theme powered with Foundation5 framework, underscore starter theme and included with SaaS (Software as a service – way of delivering applications over the Internet). Merch is 3 column WordPress theme compatible with WordPress 4+ version and coded with semantic standards. Merch is built for speed and performance, google will certainly love your site if you are using merch theme for your woocommerce website. Its cross browser compatible, search engine friendly premium WordPress theme included with multiple widget locations. Now a days finding high performing, light weight WooCommerce themes are very rare in market places. One final word, Merch is simply WoW!